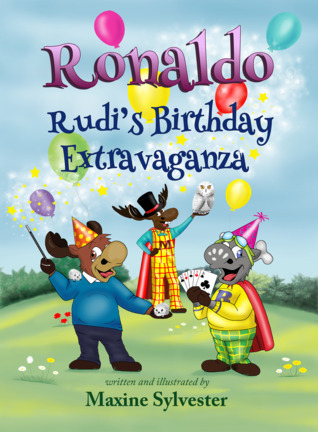 Ronaldo's best friend Rudi is having a birthday party, and their favorite magician Monty the Moose is going to perform. There's a lot to do before the party, though. Rudi hurt his hoof and has to see Doctor Kloppen. Ronaldo offers to deliver cakes for celebrity baker Mrs. Sorensson as well, but the shortcut through the forest includes bullies lurking in the bushes. This is another cute entry in the Flying Reindeer Academy books, and the art is done by Maxine Sylvester as well. As with the other books, it's geared for elementary school readers, but older readers would still find it cute. Some of the names are pulled from Santa's reindeer, so it's a fun nod to tales of the North Pole. There are humorous moments throughout the entire book, and it pokes good-natured fun at the characters. Ronaldo is a reindeer that acts in the best of ways, but can still have some moments that makes him real that every child will recognize. He and Rudi get into an argument, as friends often do, and Ronaldo has to find a way to deal with it appropriately He goes out of his way to help others and is an excellent friend. Because this is a story, his honesty and good nature are rewarded. This is a great way to show how we should all treat each other, without being super preachy or heavy-handed about it. As a summer themed book for children, that's a difficult balance to make, but Maxine certainly got it right with this one. Thank you for this lovely review I am glad that you enjoyed it and gave it 5 stars on Amazon. This is much appreciated and I will share across my social media platforms in the coming weeks and months with direct links to your blog post.